This time of year, pumpkins seem to monopolize the market – pumpkin pie, pumpkin muffins, and, lest we forget, PSLs (“pumpkin spice lattes” for those non-Starbucks drinkers). As delicious as these seasonal sweets are, have you ever considered decorating with a pumpkin? Not just stacking three or four on the front porch, but creating a showstopper display for your entryway or dining room table? If you’re like us, we can’t help but melt over the bleeding oranges and greens of the fairytale pumpkins. 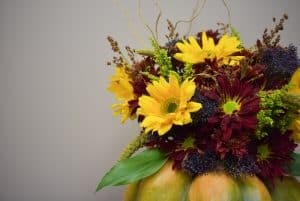 This elegant pumpkin provides the perfect foundation for the deep reds and yellows of fall florals. 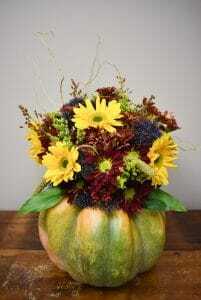 With the trim of a stem, you can create a colorful masterpiece to enjoy as autumn arrives. When picking flowers and filler, select colors that compliment the pumpkin’s hues. 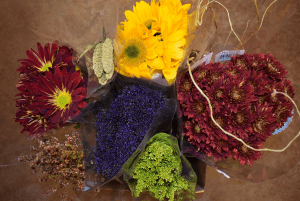 We recommend a variety – three different flowers and five kinds of fillers were used in ours. In addition, soak the water oasis for at least 30 minutes prior to arranging. The longer it can soak, the better. As with any pumpkin décor, the first step is carving. 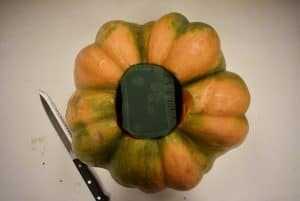 In a circular motion, cut 1-2 inches around the stem. Be conscious of the width of your opening. 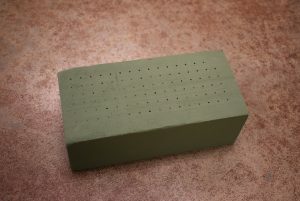 Make it just large enough for the oasis to fit snugly inside, but do not insert yet. Once the oasis has soaked, remove the pumpkin seeds and vertically place the oasis in until it reaches the bottom. Shave the edges if need be. Now, turn your attention to your flowers and filler. Trim the stems at a diagonal until you’ve found the best height for sticking in the oasis. This may take a few tries. If any flowers have low-hanging blossoms, tear them off and set aside. Begin placing the flowers in the oasis at varying heights and angles. Think about arranging in threes and fives for aesthetic appeal. Place the filler as you go, rotating which kind. 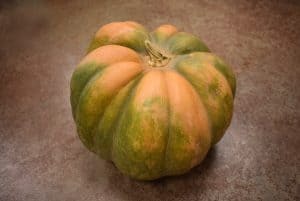 Once the bulk of flowers and filler has been used, you may notice a gap between the top of the pumpkin and the blossoms where the stems are visible. Take the remaining blossoms (that were set aside) and stick in this area to mask the stems and create a full, seamless look. If you can’t seem to achieve the look you’re wanting, try again. The art of flower arranging certainly requires creativity, but anyone can do it. We hope you enjoy (and show off) your fairytale flower arrangement. If you’re especially pleased with the final product, send a picture our way or tag us in a social media post. We don’t think even Cinderella dreamed of something this pretty.